This very elegant Georgian-style church was built in 1938 and designed by Lewis Ayres of York & Sawyer and it includes the bell and weather vane from its original structure at Beekman and Park Row that opened in Lower Manhattan in 1769 when it was known as the New Church. The church moved to Fifth Avenue and 37th Street in 1858. The church has a community house and school on 92nd Street between Park and Madison Avenues. In 1952, it added the Chapel of the Reformed Faith, designed by Adams & Woodbridge. 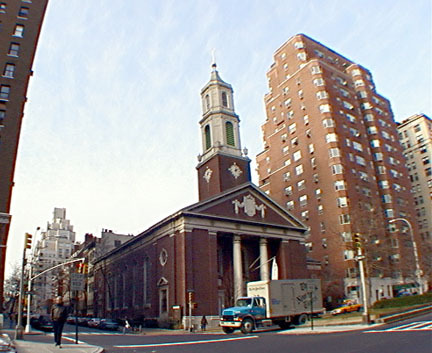 This church is related stylistically to the earlier All Souls Unitarian Church on the southeast corner of Lexington Avenue and 80th Street designed by Hobart Upjohn and completed in 1932. "Upjohn's design seemed all the more refreshing after York & Sawyer's completion of the Brick Presbyterian Church in 1938....this was a skillful but uninspired red brick and limestone design. Its roots lay in the eighteenth-century London churches of John James and James Gibbs - and Federal era churches - but York & Sawyer's detailing was so glib, so impeccably corect, that one missed all the naive provincialism of early American work." Such criticism, of course, would make mincemeat of Colonial Williamsburg. Glibness and impeccability are not always vices and both churches are very good, and demonstrate, once again, that Georgian-style architecture is extremely elegant. This structure is one of the highlights of upper Park Avenue. The building lies within the Carnegie Hill Historic District.